Company Profile : Sony Entertainment Television (SET) India is one of India's leading Hindi general entertainment television channels. Over the years, the channel has created significant marquee properties through an impressive lineup of programs ranging from the light hearted to the supernatural, exploring various genres complimented by an explosive mix of glamorous events and Bollywood blockbusters. Indian Idol 2018 Auditions are back with #KHABARPHAILADO . After 9 successful season of Indian Idol this year Indian idol coming back on Sony TV with a bang. Indian Idol is One of the Biggest Singing Platform For Singers to show their singing talent to India. If you wanted to be a known singer or famous singer then don’t miss this opportunity. Auditions are going to be held from 1st May in the following cities. This time you can be an Idol Singer for India or Indian Idol. The Participant(s) must be of or above the age of 15 years but not above the age of 30 years as on April 01, 2018. Such persons coming for the Audition shall hereinafter be referred to as “the Participant(s)” irrespective of whether such persons have been able to enter the venue gates and actually participate in the Audition. • Registration number as received from us during the process of registration. – PAN Card/Passport/Aadhar card/Driving License/Voter Identity Card. • The photocopy of the original and the original document itself should be clear and legible. - Birth Certificate of the Participant/ Passport/School leaving certificate. - Ration Card/Passport/Certificate from School. provisions of the Guardians and Wards Act, 1890. Any other claim for Guardianship shall have to be established by way of proper documentation and Company shall have the sole discretion to decide about allowing such Participants. Other Family members, relatives or friends and colleagues shall not be allowed entry into the venue. 4. Only 1 companion will be allowed per minor / differently abled Participant inside the Audition Venue. 5. Organizers will not be responsible towards any expenses incurred by the Participant for the auditions including but not limited to any travel and accommodation expenses incurred by them. 6. Participants along with their companion are likely to be frisked and belongings physically checked by the concerned security staff of the Organizer. 7. 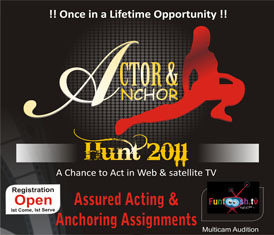 Participants will be allowed to audition only once, in any city, any re-entry would be automatically disqualified. 8. Participants shall ensure their own safety, security and well - being and Organizers shall not be in any manner liable for such arrangements. 9. Participants shall ensure that once they enter the venue gate, the Participants shall abide by the various terms and conditions and requirements and/or agreements as asked for by the Organizers, failing which Organizers shall have the absolute discretion to disqualify the Participant and such Participants will be asked to leave the venue of Audition. 10. At all times, Participants agree that the decisions of the Organizers shall be final and binding on themselves and they shall not have any claim against such decisions taken by the Organizers in respect of the Audition and the Show. 11. Participants shall sign and execute all documents and agreements as required by the Organizers to enable the Participants to participate in the Audition and/or the Show. 12. Participants further agree that the decisions of SPN/ organizers/ judges shall be final and binding with regard to the process of selection of Contestants, at any stage whatsoever, and they shall not have any claim against any decision taken in respect of the same. governing the Show, if required, either prospectively or retrospectively at any point during the Show, with or without prior intimation to the Participants. 14. All processes and/or stages of the Show including the selection and elimination of participants thereof during the same, shall be conducted as per the processes set out by SPN/ organisers/ judges of the Show and shall not be questioned by any Participant and/or their guardians, on any grounds whatsoever. 15. The organisers/ judges of the Show shall not entertain any questions pertaining to any processes including but not limited to selection of participants and the decision of the organiser/ judges shall be final and binding. 16. SPN has the right to share the contact details of the shortlisted candidates to the sponsors and partners of the Show for the sole purpose of promotion of the Show. 17. The Contest shall be governed by and construed in accordance with the applicable laws in India. All matters with respect to the Contest are subject to the jurisdiction of the Courts at Mumbai only. cewy9 Enter the letters as they are shown in the image . Kollywoodhunts.com is a public web portal owned & operated by AVS WEBS PVT. LTD. with free access and AVS WEBS assumes no liability for the genuineness and quality of response(s)/vacancy(s)/audition(s). AVS WEBS cannot monitor the responses that a person may receive in response to information he/she has displayed on the site. The individual/company would have to conduct its own background checks on the bonafide nature of all vacancy(s)/audition(s)/response(s). AVS WEBS will not be liable on account of any inaccuracy of information on this web site.